NEWS FLASH! I am thrilled and honored to be included in Jo Weldon’s new book hot off the press, FIERCE, The History of Leopard Print. Jo included a photo of The Style Crone in the chapter, “A Brief History of Vintage Clothing.” I’ve been in love with leopard print, since the 1970’s, when I began wearing and collecting vintage. I have leopard print everything: hats, clothing, jewelry, shoes, and it can be seen throughout my home adorning pillows, rugs, chair coverings, and on and on. It has been popular in every era that I’ve experienced during my life, and I don’t see that changing anytime soon. Even if it fell from favor, I would wear it anyway. Jo Weldon is an expert in the study of contemporary burlesque, women’s issues, and retro fashion. Her lectures and events about the history of leopard print have been featured in Mental Floss, The Financial Times, and the New York Times, as well as international style magazines. You can find out more about her work and more about leopard print on her website HERE… From “About the Author” in the book. If you love leopard print as much as I do, this is the book for you. Throughout this impeccably researched book, Jo covers all aspects of the history and significance of leopard. Included are 150 captivating images, which enhance the fun and fascinating information that is presented. Be prepared to be entertained and to meet amazing heroes, goddesses, icons, trophy wives, bad mothers, supervillains, activists, fashion designers, and more. She also discusses the importance of contributing to the fight for the survival of living leopards and their environment, the imperative for sustainable fashion, and organizations to join to participate in this effort. The new information that I now enjoy about my favorite print only serves to appreciate and cherish it more. You can purchase this treasure of a tome HERE. In honor of my feature in this inspirational book, I’m wearing my beloved leopard print fabric hat, which can be molded into numerous shapes depending on my mood, and matching gauntlets trimmed with leopard print, both by Norma Kamali. We carried these pieces of wearable art in my hat shop in the l980’s. It’s no surprise that they have permanent residence in the hat room. These timeless pieces have been favorites since the first time I laid eyes on their beauty. The black deco chair with leopard print seat covering graced the hat shop for the over four years that it was open. It was the perfect accessory for my outfit, which also included a black maxi dress from Cou Cou HERE, gold vintage jewelry from estate sales, black booties from a retail sale, and of course, red lipstick. Thank you Jo Weldon, for the honor. I will be catching your book signing at the Tattered Cover Book Store in Denver sometime in September. You can be sure that I will be wearing leopard! 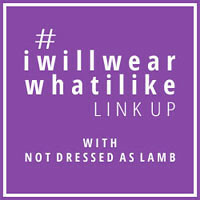 Linking up with Patti’s Visible Monday HERE and Catherine’s #iwillwearwhatilike HERE at Not Dressed As Lamb. Oh you “do” leopard print so well!! And I love leopard print. Used in a moderate way like you do. Of course you are in that book. How could you not? You are an icon now. You do realize that don’t you? I love that you smile in your shots. You look fierce and I loveeeee leopard print!!!!! I would LOVE TO READ HER BOOK! WE ALL LOVE LEOPARD…………………I donot have enough! I want a leopard carpet for my kitchen!!!!!!! Love leopard! Debra tells me you are in for fashion week! See you then! You look just sensational in your black with leopard gauntlets and hat. As a fellow lover of leopard I fully concur with the concepts. Thank you for drawing my attention to the book , I was pleased to be able to order it from an Australian book supplier, look forward to seeing you. Leopard just seems middle aged or older to me. I never see young women wearing it. I agree that it looks wonderful on you and many other women, but it just does not seem fierce to me. Congratulations on your inclusion in the book! You have some spectacular leopard print pieces (I LOVE the gauntlet gloves) so it makes perfect sense for you to be included. Aside from a vintage leopard print swing coat I had when I was in my 30’s (which I wish I still had…), I don’t have any leopard print pieces in my wardrobe. Animal prints and I have never made friends.